I made an appointment with a therapist. I want to preface this post by saying… This post is not meant to garner pity. The brochure about dealing with depression that I got from my primary care doctor said to talk to friends and family. Depression thrives on isolation, and not talking about it only makes it worse. So, I want to talk to you all. (Apparently all at once. lol! But if you want to email or call, I would definitely talk one on one as well.) So you know where I am coming from and where I am going. I don’t want you to treat me any differently. I am not fragile. I am not going to break. Because I have friends and family who love me. And I love them. And I love myself. That’s why I am going to see someone who can help me not be so sad inside so much of the time. So I guess I have to start out by saying that I have always been good at pushing all of my sad feelings way down deep. I put on a happy face for all those around me. When something sad happens, I tend to be sad at the moment and then push it down and go on with life. My thinking was that people don’t want to be around people who are sad all the time, so I put on the happy face and jump back into daily life. So I’m guessing that I just never give myself time to be sad. And the sadness has just piled up too high for me to handle by myself anymore. This past summer was a rough one for me. The first incident, on the surface, seems like it was just petty family argument stuff, but it went so much deeper. I made a scrapbook page about it. In hindsight, there was really one bitter person and then there were those that had to go along with her demands because they live with her and love her and had to â€œkeep the peaceâ€. This bitter person is someone I loved and I thought that she loved me and my family. Unfortunately, I think that if you can’t forgive, bitterness will take over your life and it can ruin not only you, but your relationships with others around you. At this point, my relationship with this person is in shambles. I don’t know if it will ever be the same. I may be able to forgive her someday (if only for my mental health), but our relationship will never be the same if she can’t find the same forgiveness in her heart for those who have hurt her. The other half of this story is my mother. I love her. With every fiber of my being. In the past, we have had our moments, as have most mothers and daughters. I stand by the statement that there are things in her past that I think were bad decisions on her part. She has changed. She has become a very different person from the one that I knew when I was growing up. And all of the things that she has done in the past, are past. I have forgiven. And we are good. Our relationship is so much better than it has ever been. I am very thankful for that. I love you, Momma. The second incident was way more obvious. The death of my cousin in a war that was never necessary is something that I don’t think I will ever get over. The war part is scary enough. But leaving behind a wife and three children who need him and love him is so hard for me. I have been through death before. Too many times in my opinion. The deaths of my brother and my grandfather at such a young age were very hard. But as I said before, I am very good at being sad for the moment and then pushing it down and getting on with life. It’s my coping strategy. My cousin and I grew up knowing and loving each other, but we didn’t spend a lot of time together. We lived so far away. But the love in our family was never lacking. He came to my wedding and we danced. I went to his wedding and we danced. He moved to Colorado and made plans to start his family. And then he was sent to war. Two more sweet children and two more tours of duty and he was gone. I have always been scared of my death, and my cousin’s death has heightened that fear. Not so much the actual event. I know that when I am gone, I will have no more worries. So I worry now. I worry how Wade will raise three boys if I was to die while they are young. I worry about how it would affect the boys and their futures. I want to see them graduate from school, go to college, get married and have children. I want to be around for these things…for them and for me. For this reason, I know I would never do harm to myself. (I have never had these feelings. Believe me. I’ve seen what suicide does to a family, and I will never go there.) I do have a very irrational fear of having a car accident, or being in a plane crash, or getting a terminal disease, though. Sometimes this fear is almost paralyzing. I have to â€œtalk myself downâ€ sometimes. I tell myself that I can’t lie in the bed all day and wait for the inevitable to happen. I have to live my life…how ever long that is…and live it to the fullest. This technique is very effective for the most part. It gets me out of bed in the morning and helps me through the day. There was a period of time, though, when the pep talks weren’t working quite as well. From about the time of the funeral to about the time I called my primary care doctor in February, I believe that I was technically depressed. I was having 4-5 headaches a week. I wanted to do nothing but sit on the couch and let the world go on around me. I got the boys to the places they needed to go. I fulfilled my obligations and that was about it. And then I called my doctor. I think it was the proverbial â€œadmitting I had a problemâ€ and it was the first step toward feeling better. I finally got in to see my primary doc at the end of February. We talked for quite a bit. She believes that I do not need medication as of yet. She wants me to talk to a therapist for a bit and see if that helps. This is what I want, too. (If the therapist believes that I need a little more [i.e. pharmaceutical] help, of course I will consider it, but I want to see if I can work through this first.) I believe that I have already made great strides. As I said, just admitting my problem is a big step for me. It means that I am not pushing it down. It means that I am allowing myself to be sad for a little bit. To acknowledge that I don’t have to be â€œupâ€ all the time. I have also begun doing some of those things that were more â€œnormalâ€ in my life before the events of this summer. The return of my daily chores. Surprisingly it helps. It gives me a goal every day. It gives me structure. (It makes my house clean. LOL) I feel like I have accomplished something and that makes me happy. Creating also makes me happy. I almost stooped creating entirely after August. I did only what was asked of me, and even then it was forced. It didn’t feel good. It’s different now. The things I am creating are for me. And it is fun again. Each day I am excited to go up in my room and get my hands dirty and make my art. My next step is to step up my photography again. The desire to take photos has been almost nil. I want to get that back. It’s my next ‘self’ project. My first appointment with the therapist is on April 7th. It was the first opening they had. And it’s ok, because I think that I am doing better right now. But I am not fooling myself. I’m certain that another â€œsadâ€ happening could put me right back where I was. I am hoping that therapy will help me deal with the future a little more appropriately. Until then, I will keep on keeping on. And now that you all know where I am coming from, I hope you will help me on my journey. I’m sure that I will need you. In closing, I want to say that if anything in this post has hurt you, I am truly sorry. Just as in the scrapbook page, these are my thoughts and feelings. I cannot say that they are right or wrong, just that they are mine. I will keep you all updated when I get started with my therapy journey! Thank you all for listening if you got this far. I love you all! Oh, sweet girl, I am so sorry you’ve been so sad, but I am so glad you’ve made the important step of making a therapy appointment. I’m sure you’d guess I support the practice, and if you ever want to hear about how I benefitted from therapy, just ask. Let me know if there’s anything— ANYTHING I can do to help. I so admire your honesty and bravery in posting this. I am really proud of you for seeking out the help you need to move forward. You do know you can call me anytime, right? Hugs to you! And you are so not alone! Your strength and heart will carry you through, and I have heard that the first step is always the hardest and you got that done already! And even though I am not as close, I am always here for you as well, anything you need that I can do, I am there! Go Heather! I admire that you are willing to share all this with us. I know that I am a ‘newer’ friend but please know that I am here for you and if you ever need anything, even last minute, please call. You aren’t alone in this journey. Lots of love to you. Oh Heather, you are such an amazing person!!! I truly look up to the fact that you have been so honest with yourself here. I’m happy that you are going to talk to someone who can help sort out your feelings and address the sadness that has been pushed deep down for so long. I’ve been in your shoes and I just know you’re going to bounce back from this better than ever! In the meantime, will you drop me an email? I know shortly before we moved you had distanced yourself from me and I never knew why. I think I totally missed something and it’s bothered me for quite sometime now. I’d love to talk to you again. Congrats on a big step, I have lots of thoughts so I think I’ll send an email your way soon. I learned more in life from my struggles and the difficult times. Events that have taken place in my life have given me so much to reflect on and made me realize that although I have been badly bruised I will survive and so will you. The truth is, we each have our own fears and insecurities no matter how great a front we put up to the outside world. I am a big believer that our personality is based on all the events that occur in our lives. Because of that, if I find a persons personality attractive, everything that they go through, no matter how hard, is a learning experience that gave me such a wonderful person to be around. You happen to be one of those people. Great first step that you are taking! Heather- Wow! I know that we don’t know each other that well, but that was an awesome post! When I was pregnant with my second child I became depressed. A lot of people called it post partum, but for me it started way before I even had her. The hardest part for me was ever admitting to anyone that I was depressed. I was ashamed of it. Why? I can’t tell you. Maybe admitting something was wrong with me, maybe a touch of vanity? Now I know that it doesn’t change who I am, it is part of who I am. I do still struggle with it now and then. I call it “falling into my pit” and a lot of times I don’t even know I am there for a while and then I realized that I have been sitting playing computer games for hours, and it hurts to even think about making dinner. Then I start to fight back. The whole point of this is to say,WOW, I am proud that you can say it! I am proud that you can fight it. And I wanted you to know that you are not alone! Thank you for your honest feelings! 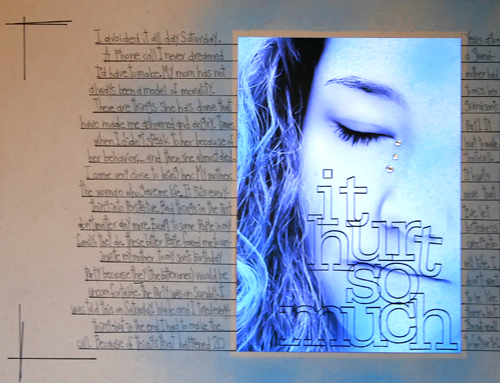 I am not a friend “per say” but I really like the atmosphere you have created with the other Journaling Challenge’s girls. 🙂 this is good baby, very good 🙂 i love you bunches. I love you! Sometimes we just have to let go and take it day by day.